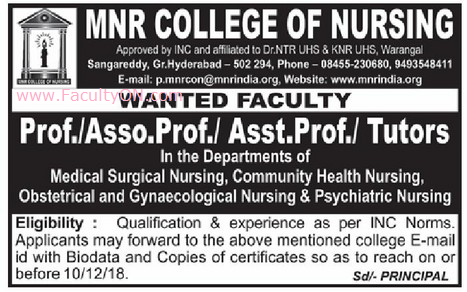 MNR College of Nursing, Sangareddy has advertised for recruitment of Professor / Associate Professor / Assistant Professor jobs vacancies. Interested and eligible job aspirants are requested to apply on or before 10th December 2018. Check out further more details below. About College: MNR College of Nursing was started in the year 2002 by the MNR Educational Trust in the MNR-AHER Campus, Sangareddy and is approved by Indian Nursing Council, New Delhi and Telangana State Nurses, Midwives Council, Hyderabad, It is affiliated to Kaloji Narayana Rao University of Health Sciences, Warangal.